The Museum of Domestic Design and Architecture (MoDA) houses what is widely regarded as one of the world's most comprehensive collections of nineteenth and twentieth century decorative arts for the home, including the renowned Silver Studio Collection. The Silver Studio Collection is the archive of one of Britain's leading commercial design studios active between 1880 and 1963. The Silver Studio was always responsive to the fashions and tastes of the moment, designing in all the major styles such as the flat stylised Art Nouveau of the late nineteenth century, as well as the perennially popular traditional and historical idiom. Its work provides a vivid insight into pattern design in the English home between 1880 and 1960. MoDA provides an invaluable resource for everyone interested in the history of design for the home. 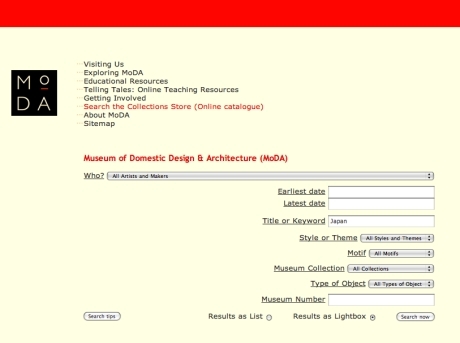 Online the digital catalogue can be accessed via 'Search the Collections Store'. Many of the records have images associated with them and more are being added daily. Eventually all items will have an associated image.